Robotics and automation are set to be a continuing part of the supply chain. Over the next few years, a big challenge will be understanding how to put these new innovations into effect. It's time to look realistically at what the next set of updates will bring, and how they will collaborate. Companies can work with managed IT services experts for greater efficiency, without having to completely lose all of the previous benefits at once. With newer, more integrated tech, companies stand to collapse the difference in their supply chains and make the process from production to point of sale more transparent. Artificial intelligence, sensors and mechanical robots all bring possible benefits in and of themselves, but the real impact could come when they work together. A 21st Century Supply Chain piece described this as "robotics process automation," a method for prioritizing the tasks which will lead to the highest value for the business overall. Both hardware and software are needed for this to work, though, from the sensors in a facility to the AI behind the machines. On the retail side, we already have at least one example of a connected robot for inventory management. CSCMP's Supply Chain Quarterly recently profiled a mobile robot named Tally, designed to move around a store space and detect individual items for sale. The source said that Tally could save businesses time and also share data to make an entire supply chain smarter. Speaking of which, some of the major drivers behind robotics are currently in the retail space. The Seattle Times recently reported on Amazon's differing numbers of human and robotic workers. According to the source, this one business is responsible for 45,000 robots and a continuous increase in human workers from 2015 to at least the third quarter of 2016. There is also some difference in the way various fulfillment centers are outfitted, as the source quoted Amazon CFO Brian Olsavsky on the subject. It's easy to think of Amazon as something larger than a retail company, especially since it's poured obvious amounts of resources into logistics. However, there's always the chance that other businesses could follow Amazon's lead and pursue robotics for different centers, as well as smarter delivery systems, including drones and connected vehicles. 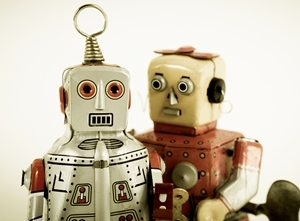 Robotics & Automation News outlined another way we might see robots change the supply chain. The article said that a smart factory could place automatic orders whenever an extra part was needed. This is important because it's an extension of the predictive analytics trend, where AI allows businesses to stay a step ahead of inc?oming trends or issues. Using this capability could specifically counter the problem of unused replacement parts, which may fill up space at factories and go unused without the proper foresight. But this development doesn't necessarily write the human manager out of the question completely. As new ideas for manufacturing continue to appear, businesses can use spend analysis to guide their decisions as well.